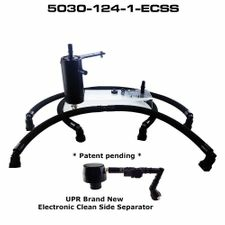 The Ultimate Oil Separator for your 2015-2019 Ford F150 3.5, 2015-2018 Expedition 3.5 & 2015-2019 2.7 Ecoboost Truck with UPR Dual Valve Plug N Play � Catch Can and UPR one way electronic pressure sensor systemv (Patent Pending). 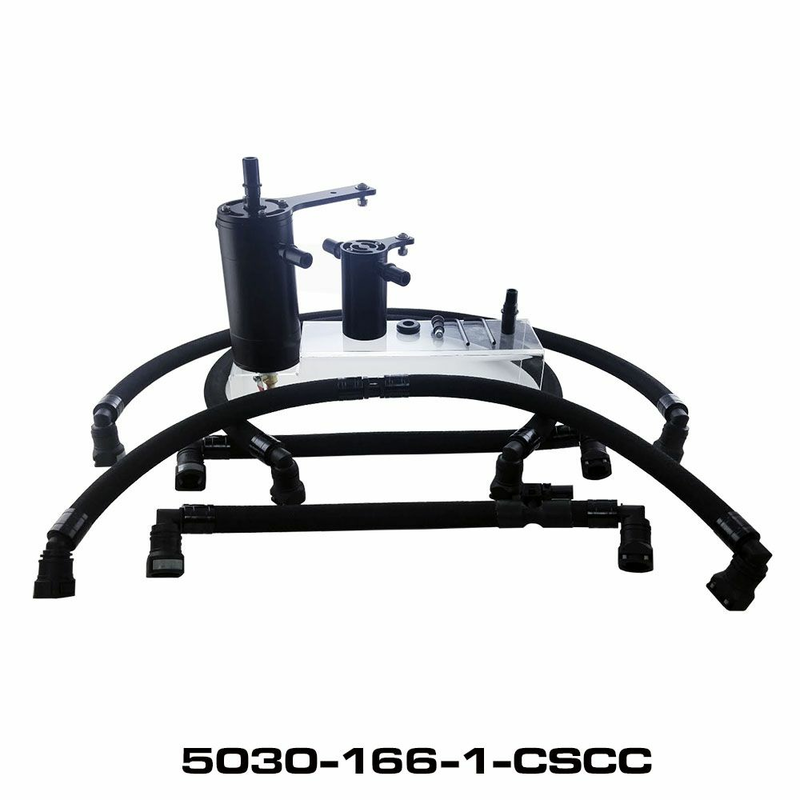 State of the art CSCC = Clean Side Catch Can System you can be sure that no other manufacturer can give you the level of quality and performance that UPR's Dual Valve Catch Can and CSCC consistently deliver. Offering the largest capacity in a compact design to be sure that it can eliminate oil vapors on vehicles that are normally aspirated or power added equipped. This system is designed to require less maintenance between oil changes and eliminate the amount of moisture that's collected from controlling condensation better by being mounted in the engine bay. Our Patented Multi-Stage Multi-Chamber internal design is the best for controlling oil vapor and mist even in the hottest mounting locations. In turn, our new design was developed to work the best in the engine bay without any second guessing of it's true performance capabilities. This system has been tested and developed to work with the factory electronics and the parameters that the EPS / electronic pressure sensor requires. Does require drilling of your factory WOT pipe. Predrilled 3.5L WOT pipe can be purchased separately above to keep your stock pipe unmodified. Most importantly it keeps your clean side and dirty side performing with the level and control they deserve and not filling the intake and CAC / Inter-cooler full of oil like the factory designed system does. Manufactured from Domestic T-6 6061 Aluminum bar stock and finished off using only the best Diamond cutters to exceed your expectations of what a superior product should fit and look like. UPR is the largest aftermarket catch can manufacturer in the country. Continually improving our designs to stay ahead of the competition and give you the cutting edge technology of tomorrow today. We are so confident we offer an unconditional warranty on our products to let you know you can always count on UPRproducts. � 2oz Can measures 3" x 2"
� 12oz Can measures 6" x 3"
2015 2016 2017 2018 2019 Ford F150 Ecoboost 3.5 2015 2016 2017 2018 2019 Ford Expedition Ecoboost 3.5 2015 2016 2017 2018 2019 Ford F150 Ecoboost 2.7 No one else can stack up to the bold clean styling of our aftermarket Billet dress ups, Street Strip & Racing Suspension & Performance Parts for your late model American Muscle Car! The Ultimate Oil Separator for your 2015-2019 Ford F150 3.5, 2015-2018 Expedition 3.5 & 2015-2019 2.7 Ecoboost Truck with UPR Dual Valve Plug N Play � Catch Can and UPR one way electronic pressure sensor systemv (Patent Pending). State of the art CSCC = Clean Side Catch Can System you can be sure that no other manufacturer can give you the level of quality and performance that UPR's Dual Valve Catch Can and CSCC consistently deliver. Offering the largest capacity in a compact design to be sure that it can eliminate oil vapors on vehicles that are normally aspirated or power added equipped. In turn, our new design was developed to work the best in the engine bay without any second guessing of it's true performance capabilities. This system has been tested and developed to work with the factory electronics and the parameters that the EPS / electronic pressure sensor requires. Does require drilling of your factory WOT pipe. Predrilled 3.5L WOT pipe can be purchased separately above to keep your stock pipe unmodified.